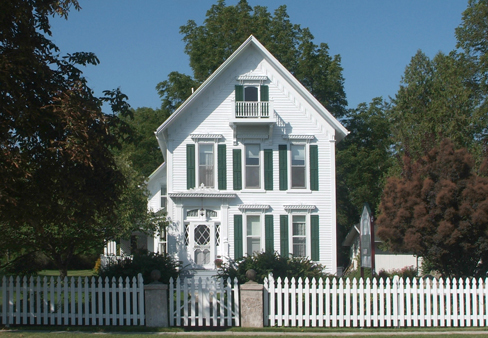 Butler Bed & Breakfast - Lexington, MI | Book Your Stay Now! Our home was built in 1879 for Phillip L. Wixson. The wood used in the house is almost all hemlock, a very straight grained, strong, weather resistant wood. The Lexington area was one of the few areas in the state where sufficent hemlock grew to allow almost an entire house to be built of this one type of wood. Robert E. and Myrtle Devereaux bought the house in 1946. Devereaux owned the Detroit and Windsor Steamship Company which provided ferry service across the Detroit River between Detroit, Michigan and Windsor, Ontario. They also owned the Bob-Lo boats at that point. Daniel G. and Dilla J. Miller bought the house in 1989 and created the Centennial Bed and Breakfast. They had the house listed on the Michigan Register of Historic Sites in 1990. We bought the house in 1998 to pursue our dream of owning a photography studio in a beautiful location. Although we no longer operate the studio, we would like to share the beautiful setting with you. Come visit us and enjoy the beauty of Lexington, Lake Huron and all that the Thumb of Michigan has to offer.